The other week I participated in a ghost walk around Newcastle city centre and although I’m not a believer in the supernatural by any means, I was intrigued by this region’s gruesome history and wasn’t disappointed. As Exhibitions Officer at South Shields Museum I often wander past a grim reminder of South Shields’ own reminder of a macabre story involving the murder of local Town Magistrate, Nicholas Fairles in 1832. 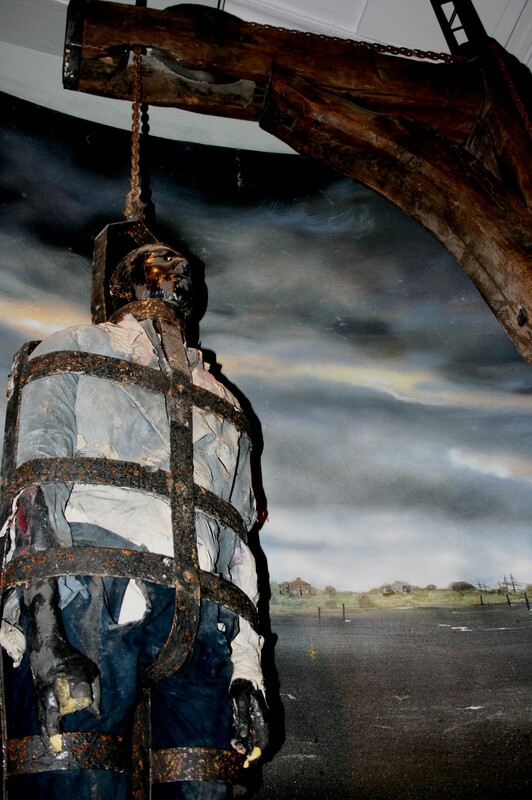 If you visit the Changing Faces gallery within the museum you will undoubtedly come across the gibbet with the (replica) body of the miner, William Jobling. The story goes that strikes at the Jarrow Colliery over pay and working conditions had left many of the miners in dire straits and following a night on the drink, Jobling approached Fairles for some money. Having been refused this loan, Jobling and an accomplice, Ralph Armstrong, viciously beat the magistrate and left him to die. Armstrong was never caught, but Jobling was hunted down, tried and sentenced to his death with his body to then be suspended from a gibbet thereafter. A gibbet was a frame, often made of metal, built to contain the body of a criminal and hung from a gallows for all to see. Apparently it was common for criminals to be placed inside this structure whilst alive up until the 17th century. They would have been left to slowly die and then decompose over a number of months as a stark reminder to all na’er-do-wells that this would be their punishment if caught and tried for crimes such as murder and even sheep-stealing. Gibbeting was a form of punishment that was used alongside hanging but not everyone was in favour of this form of death penalty, especially given that rotting bodies emitted a stench that led to fears over the spread of disease! We know of several gibbeting structures around the North East, including “Winters Gibbet” in rural Northumberland, demonstrating just how popular this punishment was. Following the passing of the 1752 Murder Act, the bodies of gibbeted criminals were often passed over to the Barber-Surgeons for dissection providing one last bit of humiliation for the criminal. However, in the case of William Jobling’s death, this was not the case. 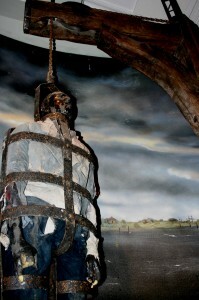 Having been placed in the gibbet (probably having been executed beforehand), his tar-covered body was supposed to have been left there in public view for a significant period of time. The addition of the tar meant that decomposition was slowed significantly and the body could be left on display for much longer. Hi, I am the Arts, Heritage and Culture worker the YMCA North Tyneside. We have received funding from the Heritage Lottery for a new project called ‘Hands Across the Tyne’. Like our previous heritage projects this will have a creative approach to engaging children and young people. In our year long project, we are going to look into the local history of Howdon and Jarrow, including the ferry crossing that linked the two communities. The ferry crossing was active from the beginning of the 19th century right up to the day the Tyne tunnel was opened in 1967. The project will bring the two communities together with creative heritage workshops and intergenerational activities. Our young people will be uncovering new research by interviewing older folk from Howdon and Jarrow, this will be documented in the project with the help of Amber Films. I have just seen your article from 2012 about the gibbeting of William Jobling. Do you still have the gibberish on display, as I would like to take my group to look at it when we start the project. I am a keen local historian and i have volunteered at Jarrow Hall ans St Paul’s. i think his family took his body and buried him in st pauls. was he Catholic or Protestant?